Flower arrangement enthusiasts will be all over this unique selection! The colorful corona of the calyx—the spiky leaves at the base of the flower—is the show here. 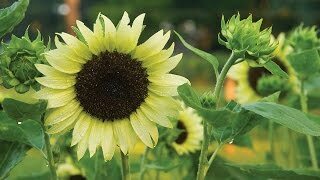 Like something out of a reverie, this delightfully unique sunflower will entice kids and adventurous gardeners. Cut flowers early before petals form for a dramatic addition to bouquets. Blooms are 3-4" in diameter. Sunflower, Sun-Fill Green Hybrid is rated 3.0 out of 5 by 2. Rated 5 out of 5 by Fern from Beautiful flowers! great germination, absolutely beautiful blooms! We were in an extreme drought area this year, and this still grew very well with little extra watering. Rated 1 out of 5 by Swissymoo from Horrible I planted the seeds In June. They all flowered but not the color I purchased. The stems were not strong enough to hold up flower head.